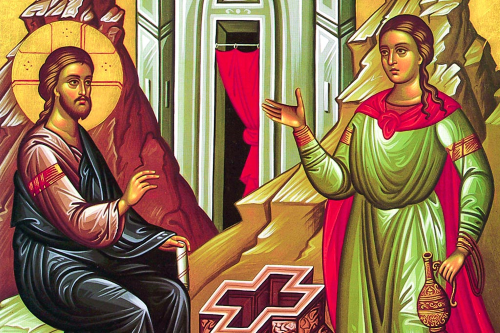 You are here: Home / News / St. Peter Newsletter May 9, 2017 — The Samaritan Woman, Mother’s Day, Christ Pantocrator Icon and more. St. Peter Newsletter May 9, 2017 — The Samaritan Woman, Mother’s Day, Christ Pantocrator Icon and more. Tne of the most ancient cities of the Promised Land was Shechem, also called Sikima, located at the foot of Mount Gerazim. There the Israelites had heard the blessings in the days of Moses and Jesus of Navi. Near to this town, Jacob, who had come from Mesopotamia in the nineteenth century before Christ, bought a piece of land where there was a well. This well, preserved even until the time of Christ, was known as Jacob’s Well. Later, before he died in Egypt, he left that piece of land as a special inheritance to his son Joseph (Gen. 49:22). This town, before it was taken into possession by Samaria, was also the leading city of the kingdom of the ten tribes. In the time of the Romans it was called Neapolis, and at present Nablus. It was the first city in Canaan visited by the Patriarch Abraham. Here also, Jesus of Navi (Joshua) addressed the tribes of Israel for the last time. Almost three hundred years later, all Israel assembled there to make Roboam (Rehoboam) king. When our Lord Jesus Christ, then, came at midday to this city, which is also called Sychar (John 4:5), He was wearied from the journey and the heat. He sat down at this well. After a little while the Samaritan woman mentioned in today’s Gospel passage came to draw water. As she conversed at some length with the Lord and heard from Him secret things concerning herself, she believed in Him; through her many other Samaritans also believed. Read more on the Greek Orthodox Archdiocese website. 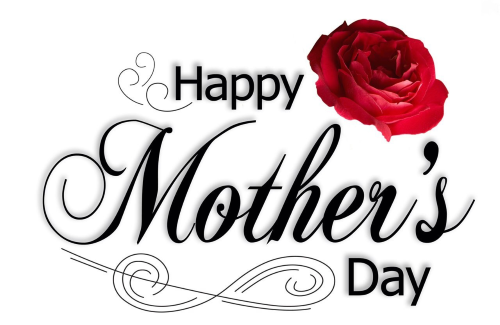 Happy Mother’s Day to all mothers, God-mothers, aunts, and more! In honor of all moms (and in all the ways women are mom’s). To honor you we will distribute flowers after Liturgy this Sunday. The word Pantocrator is of Greek origin meaning “ruler of all”. 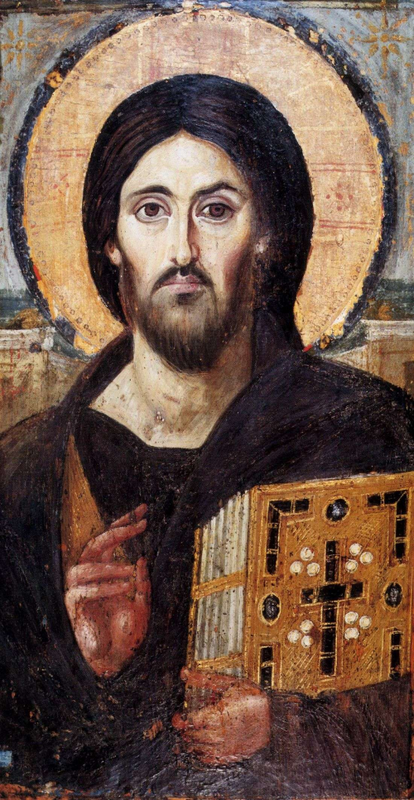 Christ Pantocrator is an icon of Christ represented full or half-length and full-faced. 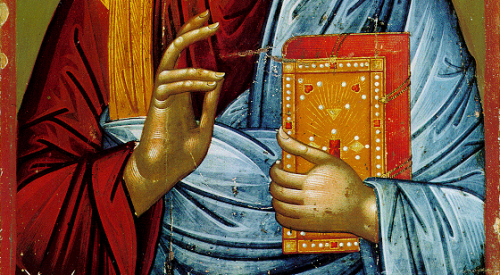 He holds the book of the Gospels in his left hand and blesses with his right hand. This is also why the eyes appear different, one is softer, the other more severe. It is the tradition of the Church to depict “God is with us” by having the a large Pantocrator icon inside of the central dome, or ceiling of the church. The oldest known Pantocrator icon was written in the sixth century. It was preserved in the monastery of St. Catherine in the Sinai desert. This remote location enabled the image to survive the iconoclastic era in Byzantine history (726-815) when most icons were destroyed. It is very useful to know that a fruit of pure unwandering prayer is the renewal of our nature, and that our renewed nature is adorned and endowed with gifts of divine grace. And thus, if it is needful for man again to come into the original condition in which he was created, that is, to become incorrupt, no human free will whatsoever can raise him up into this condition, but only a Divine power received by him through a mingling with the Divine nature. It is difficult for you, but think of how it was for the Savior on the Cross. The end is near; life passes quickly. We are guests on earth, migratory birds. As man I deliberately transgressed the divine commandments, when the devil, enticing me with the hope of divinity, dragged me down from my natural stability into the realm of sensual pleasure; and he was proud to have thus brought death into existence, for he delights in the corruption of human nature. Because of this, God became perfect man. In this way, by enticing the insatiable serpent with the bait of the flesh, He provoked him to open his mouth and swallow it. This flesh proved poison to him, destroying him utterly by the power of the Divinity within it; but to human nature it proved a remedy restoring it to its original grace by that same power of the Divinity within it. If here in exile, in this accursed land of weeping, our holy God has given us so much beauty to enjoy, I wonder how much there will be in the place where God Himself dwells! Be careful not to judge anyone. Judgement of your neighbor is linked to pride, and pride is our number one enemy; all our unhappiness comes from it. How great are Thy works, O Lord! In wisdom hast Thou made them all. In those days, the Disciples, who were scattered because of the persecution that arose over Stephen, traveled as far as Phoenicia and Cyprus and Antioch, speaking the Word to none except Jews. But there were some of them, men of Cyprus and Cyrene, who, upon coming to Antioch, spoke to the Greeks also, preaching the Lord Jesus. And the hand of the Lord was with them, and a great number that believed turned to the Lord. News of this came to the ears of the church in Jerusalem, and they sent Barnabas to Antioch. When he came and saw the grace of God, he was glad; and he exhorted them all to remain faithful to the Lord with steadfast purpose; for he was a good man, full of the Holy Spirit and of faith. And a large company was added to the Lord. So Barnabas went to Tarsus to look for Saul; and when he had found him, he brought him to Antioch. For a whole year they met with the church, and taught a large company of people; and in Antioch the Disciples were for the first time called Christians. Now in these days prophets came down from Jerusalem to Antioch. And one of them named Agabus stood up and foretold by the Spirit that there would be a great famine over all the world; and this took place in the days of Claudius. And the Disciples determined, every one according to his ability, to send relief to the brethren who lived in Judea; and they did so, sending it to the elders by the hand of Barnabas and Saul. At that time, Jesus came to a city of Samaria, called Sychar, near the field that Jacob gave to his son Joseph. Jacob’s well was there, and so Jesus, wearied as He was with his journey, sat down beside the well. It was about the sixth hour. The woman said to Him, “I know that Messiah is coming [He Who is called Christ]; when He comes, He will tell us all things.” Jesus said to her, “I Who speak to you am He.” Just then His Disciples came. They marveled that He was talking with a woman, but none said, “What dost Thou wish?” or, “Why art Thou talking with her?” So the woman left her water jar, and went away into the city, and said to the people, “Come, see a man Who told me all that I ever did. Can this be the Christ?” They went out of the city and were coming to Him.